Sky has apologised to Game of Thrones fans after it had problems streaming the show via its Now TV app on Apple TV set-top boxes. 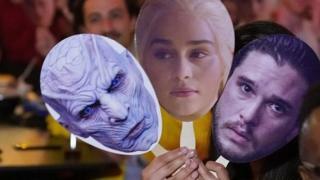 The issue coincided with the highly anticipated premiere of season eight of the fantasy series on the firm's UK internet service. Some users were unable to log in at all while others were shown poor quality video with smeared colours and green digital artefacts spoiling the image. Other overseas apps also had glitches. A spokesman for Sky said that only a minority of its overall Now TV user-base had been affected over the course of Monday evening but was unable to provide a detailed explanation for the fault. "We know how big an event Game of Thrones is and we're sorry some fans had problems watching it on Apple TV," he added. "We fixed it as quickly as possible and have put in place extra measures to make sure it doesn't happen again." The programme had been available for most of Monday daytime after going live on the service at 03:00 BST. While the problem was ongoing, Now TV's social media team had suggested that users try streaming the show via a different device such as a PlayStation, Xbox or native Smart TV app. But annoyed viewers pointed out that since they had purchased their Now TV subscription via their Apple TV's iTunes account, they were blocked from streaming it to their television by other means. However, Sky does in fact offer a way to extend accounts to other products via an online registration process. Season eight: Worth the wait? While Sky's problems were limited to Apple's platform, there were reports of problems elsewhere. HBO - the US network that makes Game of Thrones - acknowledged in a tweet that some Latin America-based members of its Go service were having problems. Some had seen the service fail mid-episode. Users who had purchased access to HBO via the US-based Hulu app were also mistakenly shown messages saying that the programme was "currently unavailable" or that their subscription did not include the series. In both cases, the issues appear to have been solved. Members of another US-based service, AT&T's DirectTV Now, had a more pleasant surprise when the streaming platform briefly made the episode available several hours before it was supposed to go live. "When we became aware of the error, we immediately fixed it," said the firm in a statement. Despite the variety of legal ways to watch Game of Thrones, many people have turned to pirated copies of the show. According to the news site Torrentfreak, more than 120,000 people were actively sharing three torrented copies sourced from an Amazon download on Monday shortly after it had become available.